Going to #edchatnz conference tapped into a lot of the themes I have been pondering and aided to solidify a few things and also unlock more questioning. Typical. Who holds the knowledge in your classroom? Gone are the days of the teacher as ‘Knower of all things worthy’ and in control of releasing this golden knowledge as per the schedule. Our students are savvy in finding information and open to a learning design that sees them approach a problem from a variety of angles. I can empathise with teachers who are struggling with this paradigm shift. After many years of accumulated classroom experience which has supported an industrialised model of teacher as single point of power and control within the classroom, it is now obsolete. As we are aware, it is not only education but a variety sectors where traditional knowledge structures have been fractured and what was once costly and time consuming is now being given away for free and available in our hands when we want it. The challenge now becomes how can we design learning to support our students within this open knowledge environment? How do we approach this dynamic, new and unknown territory? Unlock the mystery of the teacher planner and co-construct the learning with the students. This was echoed by a variety of presenters in different ways and applications. 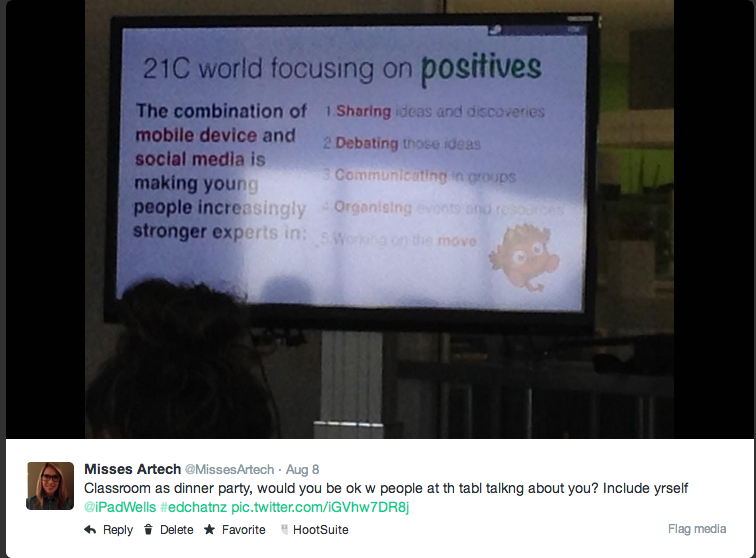 @ipadwells shared his use of big, demanding problems supported by a learning environment that is personal, flexible and social by harnessing the power of social media and mobile device use. By focusing on the positives of tech use students are empowered in their learning. And although I missed the HPSS teachers as I went to the political debate, I am aware of their journeys to open up the learning possibilities using co-constructed cross-curricular projects coupled with team teaching strategies. Be comfortable facilitating uncomfortable learning. 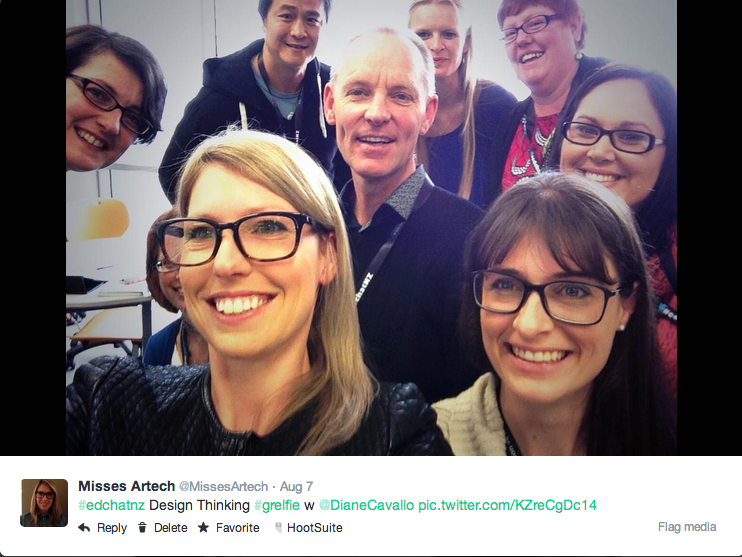 I am a fan of Design Thinking and have been experimenting with rapid ideation in my classroom over the past year however something that stuck for me during @dianecavallo’s presentation on Design Thinking was the key idea of supporting a space where students navigate the uncomfortable. When Di spoke about how designers are often in a state of high anxiety when ideating I smiled. Yip, I love that space. It’s something that designers are often so comfortable doing that it becomes second nature and I took a moment to step back and watch how Di facilitated the rest of the session, in particular watching participants struggle to be ok within the process of discovery. This is exactly what happens in my class and made me look at the ideation process from an outsiders perspective and question what can I do to hold onto the uncomfortable unknown space longer for my students to support their a-ha moments. Game-inspired learning doesn’t need to be lock in before pushing play. Listening to @bronst I nodded away as she touched on areas that I have been exploring for a while to date. Reiterating that it is essential to learn from games and take the best bits to make something non-game like better. The moment came when she discussed a letter a parent had given a child who had been grounded, the daughter could choose which chores to do to earn points and once a target had been reached she was no longer grounded. This highlighted the need for player choice in game-inspired systems, also the choice should not be linked to assessment but to habits and things that are to benefit for the learner. Another key element she discusseds was to have a juicy hook to begin with and then once players are interested ask them how to continue the game. Co-construct new levels, challenges and in-game incentives with students asking them what they think will be of value or what to aim for. Thinking about my Year 8 Pirate Quest I’ve started to link why some of the parts where successful while others fell short of my expectations. While I did take time to question and gain feedback from the students I missed the opportunity to fully co-construct the game which could’ve given us more in-the-moment direction and supported the game-designer role to be student directed. Mark outlined that at the centre of the change needs to be the teachers values, then their practice and finally overlaying these fundamentals is the physical environment. Throwing a few beanbags and a few whiteboard desks into a classroom will do very little if change does not start with the teachers values and their practice. I reflected on my use of space, the limitations I have and what I do with what Ive got. One of the classes I take is not in a purpose built space and I move equipment in by trolley at the start of the day and completely transform it to what we need on that day. At the start of the lesson we discuss what the plans are for the day and collectively decide how the tables should be – one long table in the middle, spread apart or pushed to one side with more floor space. At the beginning of one lesson we had a new entrant oval shaped table, after a discussion we decided to put it up the front and kneel around it to use as a feedback space. It was the perfect thing for that particular day. Another catalyst for finally pushing publish on this post is three nominations for the #edchat meme and our email challenge. 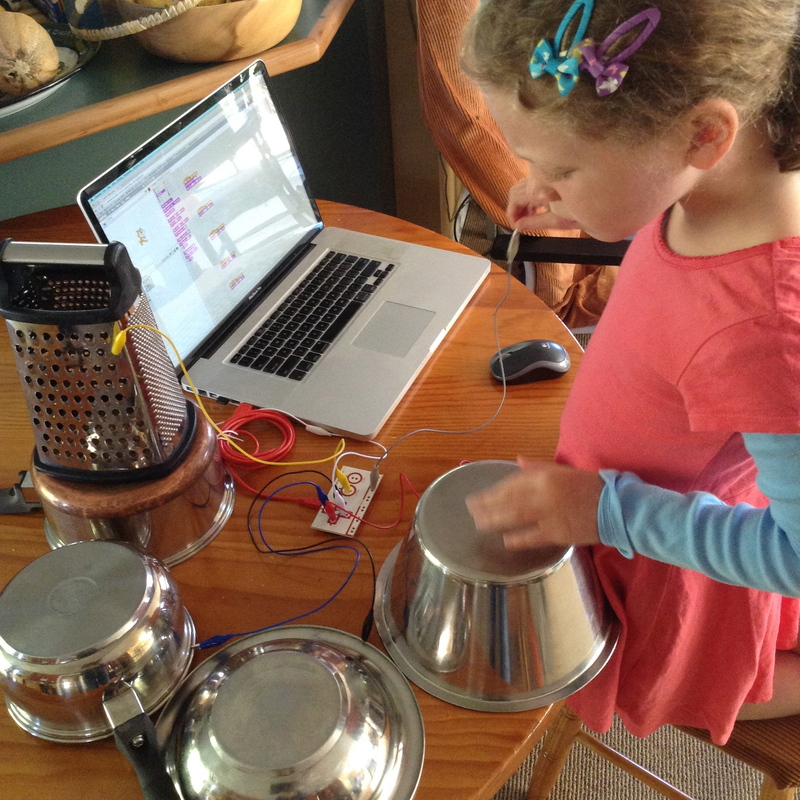 One of the challenges should have been to run an impromptu session – maybe I could get extra points for my mini-Maker breakout? No planning and off the cuff – surely extra points deserved? 4. Who are 3 people that you connected with and what did you learn from them? @Bronst – reminded me about the essentials of game-inspired learning design and to be comfortable with not having all levels/structures planned out, use it as an opportunity to co-construct with students along the way. 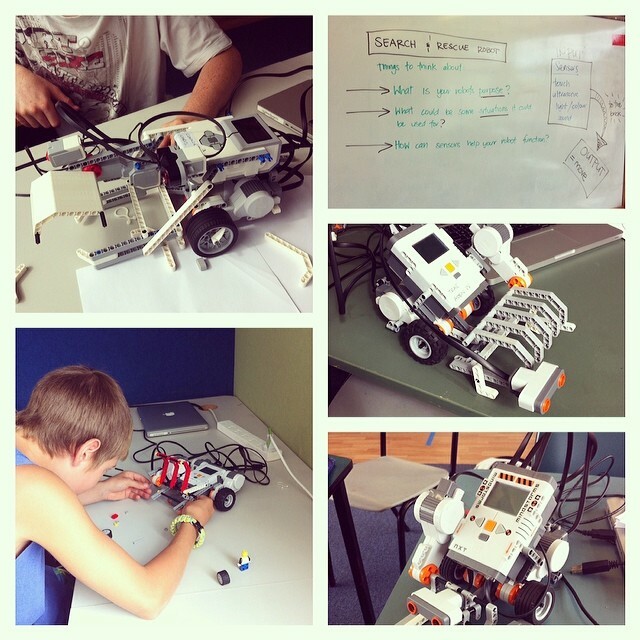 @ipadwells – to launch into big scary projects with students. Students want to be challenged and aren’t afraid to use a myriad of excuses to highlight just how boring we can be to them. Key to making it work for students is an environment that is flexible, social, and personal that they can actively engage in and with. 7. Is there a person you didn’t get to meet/chat with (F2F/online) that you wished you had? Why? Yes – @BridgetLCM. I kept looking out for her and I think I saw her but then wasn’t sure. There are a bunch of others that I did meet that I would have loved to launched into more discussion with – oh well, next year. 9. 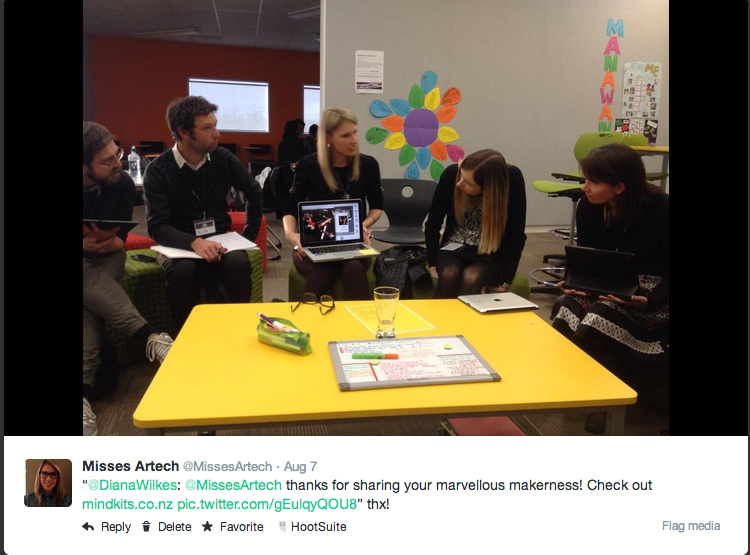 What is one thing you plan to do to continue the Education Revolution you learnt about at #EdchatNZ? 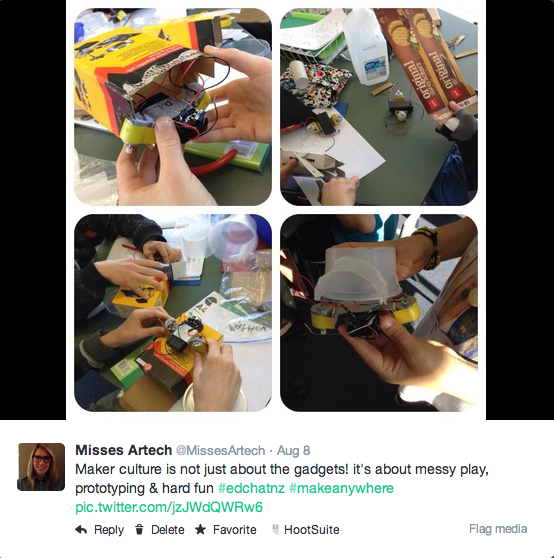 To keep prototyping my pedagogy and continue to challenge my students though doing and making. It is easy to get caught up in the latest toy, gadget or nifty table but the magic has nothing to do with the physical – my tweet sums up my thoughts. 10. Will you take a risk and hand your students a blank canvas? I endeavour to with all my classes. I am going to embrace the unknown and support students to wander within that uncomfortable space that I lived for in my previous design life – I know that is where the best personal learning can occur. Wow, an impressive first blog. Great reflections and awesome stimuli.